Wednesday, the Information Office of China’s State Council released a new white paper on Tibet, lauding Tibet’s current “path of development” — and denouncing the Dalai Lama and his “middle way” concept. [F]or Tibetans: the protection and preservation of their culture, religion and national identity; for the Chinese: the security and territorial integrity of the motherland; and for neighbors and other third parties: peaceful borders and international relations. 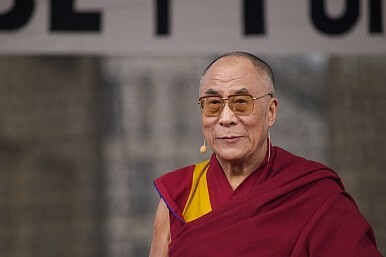 The current Dalai Lama, meanwhile, is accused of using violence to pursue his goal of Tibetan independence , including the charge that he encourages self-immolations. “Investigations by China’s public security organs into incidents of self-immolation revealed clearly that they are being manipulated and instigated at the highest level by the Dalai group,” the white paper claims. In 2013, the Gross Regional Product (GRP) of Tibet reached 80.767 billion yuan [$13 billion]; the per-capita net income of farmers and herdsmen was 6,578 yuan [$1,060] and the per-capita disposable income of urban dwellers was 20,023 yuan [$3,228]… In 2013, the population of Tibet rose to 3.1204 million, and average life expectancy was 68.2 years. These represent a tripling and a doubling of the respective figures from the early 1950s… Illiteracy has been wiped out among the young and the middle-aged, and the average length of time spent in education for people above the age of 15 has reached 8.1 years. A basic medical and health service system has been established. Beijing uses this progress as evidence that its rule over Tibet is the only possible path for development. “Any person or force that attempts to resist the tide will simply be cast aside by history and by the people,” the white paper concludes. Last year there were rumors that the Dalai Lama was engaged in talks with Beijing, even that he might be allowed to visit China on a pilgrimage. This white paper, with its unequivocal denunciations of both the Dalai Lama and his “middle way,” shuts the door on that the possibility. Dalai Lama says it is possible that his successor might be found in India.